Easter Free Create Your Own Luck Bingo - This resource includes 24 Easter related images and vocabulary words and a blank "MY BINGO CARD" template that students can use to create their own unique Easter themed bingo cards. Sign up for our EMAIL NEWSLETTER to receive important news, product announcements, and special deals and promotions. Make sure to FOLLOW US by clicking the STAR at the top of our store's main page to be eligible to win a $25 TpT Gift Certificate every month. Visit our page on FACEBOOK for exclusive giveaways. Copyright © Jason’s Online Classroom. All rights reserved by author. This product is to be used by the original downloader only. Copying for more than one teacher, classroom, department, school, or school system is prohibited. This product may not be distributed or displayed digitally for public view. Failure to comply is a copyright infringement and a violation of the Digital Millennium Copyright Act (DMCA). Clipart and elements found in this PDF are copyrighted and cannot be extracted and used outside of this file without permission or license. Intended for classroom and personal use ONLY. See product file for clip art and font credits. We really do care about each of our customers and we make sure we do everything in our power to provide you with quality resources. Thank you so much for downloading from us. 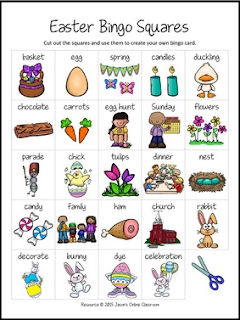 Have fun using this Easter themed bingo resource!